All items in Sprint.ly can be estimated. Each item by default has a circle with a "?" on it. To estimate an item click on circle with the "?" on it and select an appropriate size estimate. Any story, task, defect, test, and sub-item can have a size estimate assigned to it. Sprint.ly uses t-shirt sizes rather than story points. We technically map these to modified Fibonacci numbers in the backend, but use t-shirt sizes because they're less technical and further stress estimation and time are not related. What your rough velocity is in days. Who on your team has too much or too little work. On the positive Y axis we show your velocity expressed in a number of days. This is calculated based on mapping t-shirt sizes to a modified Fibonacci sequence: ? = 0, S = 1, M = 3, L = 5, XL = 8 points. 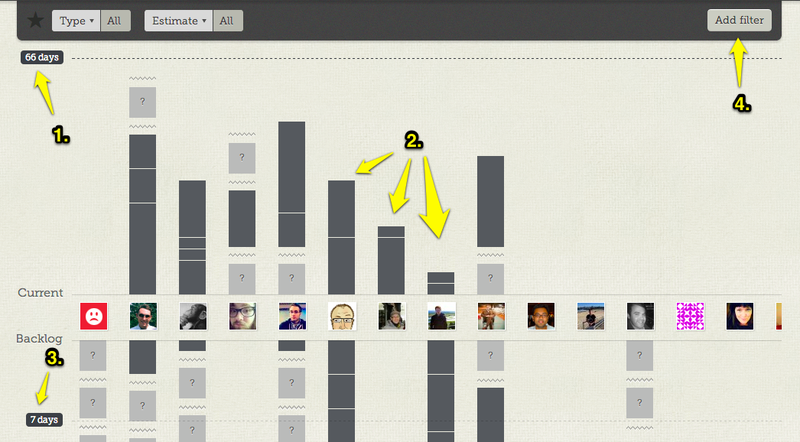 We show a stacked bar graph that is each item assigned to each person on the team proportional to the size estimate. Smaller portions are size S, larger are L, etc. This allows you to quickly see who on the team might be overloaded. We also show velocity metrics going down the negative Y axis, which is your Backlog. If you filter the Timelines view, it will also filter the velocity metrics. This allows you to track velocity against different tags or initiatives independently. How can I track a sprint's velocity? You can do this by tagging your items with a sprint tag, such as #sprint1, and then filtering Timelines by that tag. Can I use regular story points instead? At this time we only allow t-shirt sizes. You can use our API to export estimates and convert them to Fibonacci numbers if you like. Some of our customers do this to create their own burn down charts. How can I estimate XS items? lf you have items that are smaller than S = 1, you can create a Story that has the ability to add sub-items which can serve as your list of XS items. Estimate your Story accordingly. You can also read about how Sprint.ly calculates velocity.